Sid Miller’s first two full-length poetry collections appeared in 2009: Nixon on the Piano (David Robert Books) and Dot-to-Dot, Oregon (Ooligan Press). This fall he was the writer-in-residence at the Sitka Center for the Arts. 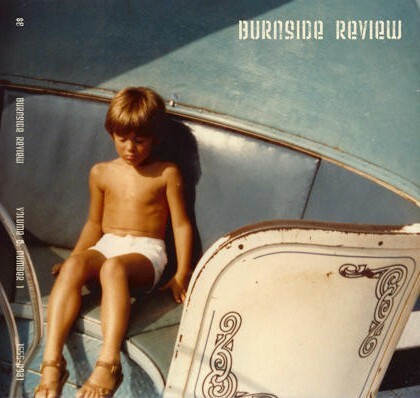 He is the founder and editor of the literary journal Burnside Review. Natasha Stagg: How does Burnside Review fit into the world of publishing today? Sid Miller: I think we’re kind of caught in between worlds. We still are (and will always be) a paper journal. While we tend to publish less contemporary styled work, our aesthetic is more modern. NS: Does it do anything that no one else is doing? SM: I suppose every journal/magazine does something that no one else is doing, purely because of the editors. Beyond that, our size and visual aesthetic is unique. NS: Where are you from, and where do you live now? SM: I am from Honolulu, Hawaii and live in Portland, Oregon. NS: How do you feel about literary journals in general: simply a necessary means to an end, or something more worthwhile than even anthologies these days? SM: It’s hard to say, and often depends on my mood. It’s different with independent journals (such as Burnside Review). Are we a necessity? Of course not. Is it purely for my vanity? I hope not. I guess in some ways editing is just another form of artistic expression. NS: What kind of stuff does your journal publish? SM: Hard to say. Anything that breaks my heart. Nothing experimental. Something that shows craft, that I can see has been crumpled and revised, crumpled and revised. Nothing that works solely by smoke and mirrors. NS: How do we submit? SM: Never a reading fee, only online. There are reading periods, but they’re never set in stone. Basically 3-5 poems. It still surprises me how many people still continue to screw these basic rules up. The guidelines are up on the website and really simple. I don’t have much patience for people who can’t follow simple directions. NS: Do you think literary journals are endangered? NS: Is becoming “online only” something to be worried about? SM: We’ll stop being a journal before we switch formats. Don’t get me wrong, there are some really great online journals, publishing a lot of great work, but it’s nothing I’m interested. I don’t want to produce something that you can’t put it in your coat pocket and then rest your whiskey on. NS: Will only the fittest survive, and could this be a good thing? SM: Of course and of course. We’ve been around 7 years, that’s getting into dinosaur years for an independent. I’ve seen tons come and go. Most people don’t think about sustainability. University presses are a whole different beast. NS: Had you heard of Sonora Review before this? SM: Of course. I used to live in Tucson and you’ve rejected my own work very recently.